Smart-Growth Challenge: A vacant office building, a contaminated site, and crime-ridden housing, but lots of assets nearby. Can the total become greater than the sum of the parts? 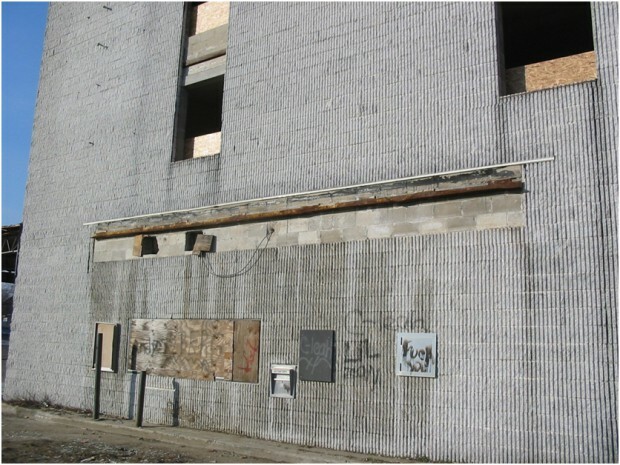 In 2004, the dominant features of the Whitman Park redevelopment area were a vacant office building and a contaminated lot. The area sat adjacent to another trash-strewn vacant lot and to Tamarack Apartments, a housing project marked by high vacancy rates, crime, poor maintenance, and structural damage from fire. Even Whitman Park, from which the area takes its name, was poorly maintained and seldom used. To get to nearby amenities by foot, Tamarack residents would have to navigate through the crime-ridden housing project and across the brownfield, past the vacant office building, and along broken and unlit sidewalks. For all its problems, however, the area also offered potential. It is located directly across from the Ferry Avenue station of the PATCO high-speed line. Whitman Park includes a playground, baseball fields and football fields. Our Lady of Lourdes Hospital, a major employer and a stabilizing influence on the neighborhood, is a few blocks away. A retail strip and a supermarket are nearby. The county had made substantial infrastructure improvements to Ferry Avenue, and had planned a new library west of the site. The challenge was how to develop the area so that it would connect well to these amenities and allow them to help infuse the area with a new sense of vibrancy. 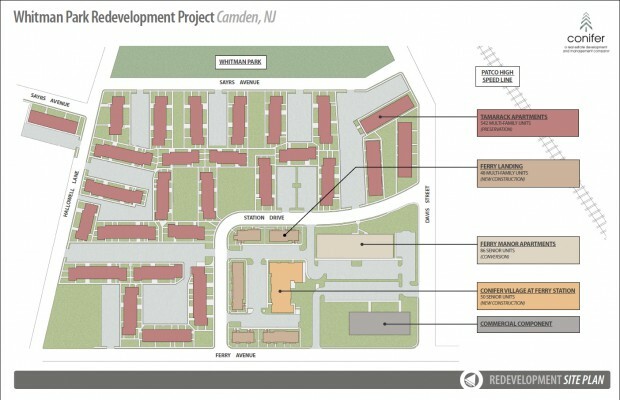 In 2004, the City of Camden adopted a plan that called for the redevelopment of the office building, construction of affordable housing on the contaminated site, and for some commercial development on the adjacent lot. While the plan was being prepared, Conifer Realty LLC acquired the Tamarack Apartments. 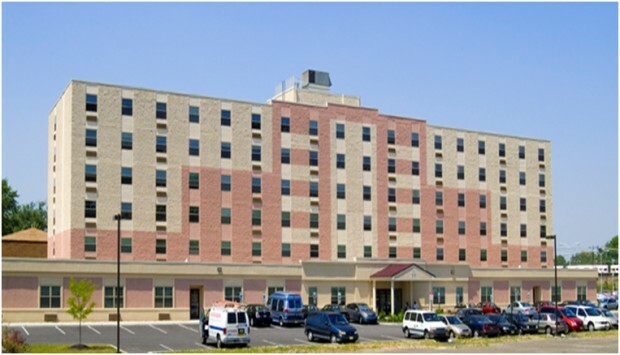 The criminal activity was removed, the fire-damaged building was demolished and replaced, and maintenance and upgrades, including to HVAC systems and weatherization, were performed. Although not technically part of the Whitman Park Redevelopment Plan, the renewed Tamarack Apartments became the catalyst for stabilizing and revitalizing the area. 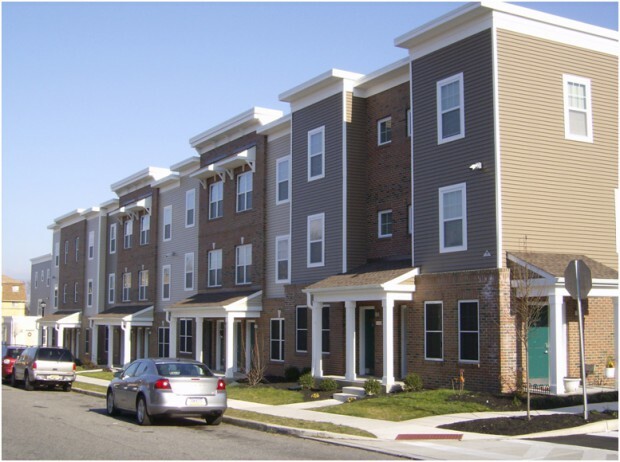 In 2005 Conifer rehabilitated the vacant office building, utilizing Low-Income Housing Tax Credits and state housing money to convert it into 86 affordable apartments for senior citizens. The building opened in 2006 and has been fully occupied since. Next, Conifer remediated the contaminated site, and formed a partnership with Parkside Business and Community in Partnership (PBCIP), a neighborhood based non-profit organization, to develop it. Construction of Conifer Village at Ferry Station, a 50-unit rental development for senior citizens, began in 2010. In early 2012, the partnership broke ground on the construction of Ferry Landing, a 48-unit townhouse development for families. 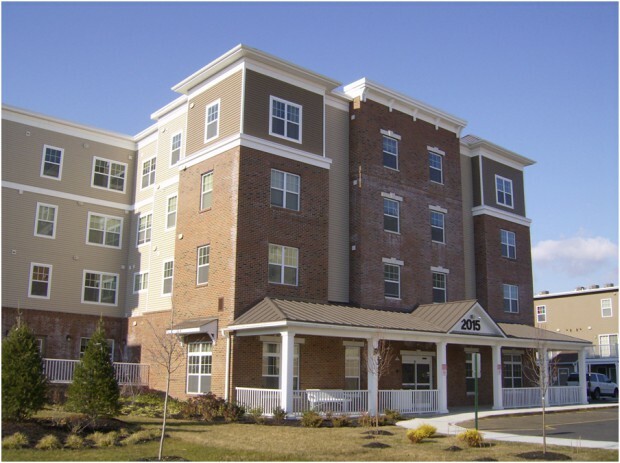 Both projects were developed under the Green Futures Program of the New Jersey Housing and Mortgage Finance Agency. In addition, the city and redevelopment agency provided HOME funds and payment in lieu of taxes agreements. PBCIP provided local input and worked to ensure that more than 30% of the construction contracts went to local firms and over 40% of the construction jobs to community residents. The development team also worked closely on a program to train Camden residents in construction management. Conifer and PBCIP have now installed the infrastructure necessary to support 15,000 to 30,000 sq. ft. of commercial/retail activity on the adjacent vacant lot. The redevelopment has increased housing options and enhanced connections to both the Ferry Avenue PATCO station and Our Lady of Lourdes Hospital. But one of the most dramatic effects has been on Whitman Park itself. The residents of the community have taken ownership of the park, which is now heavily utilized. The City of Camden has invested substantially in upgrading the park’s facilities and offering activities for neighborhood youth. And so a run-down park that first acted as an anchoring asset to a disused neighborhood as it redeveloped has now itself been rejuvenated – by the neighborhood it stabilized. Are you receiving our Future Facts newsletter?